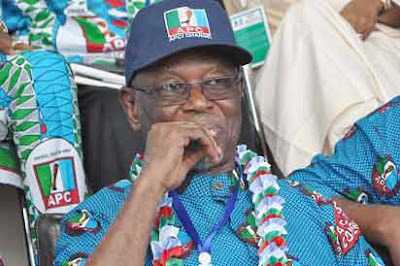 ABUJA–National chairman of the All Progressives Congress, APC, Chief John Oyegun Wednesday expressed optimism that his party would win the forthcoming governorship election in Bayelsa State. Bayelsa which is the home state of the immediate past Nigeria’s President, Dr. Goodluck Jonathan is currently under the control of the opposition People’s Democratic Party, PDP. Oyegun spoke in Abuja when a delegation of some People Democratic Party (PDP) leaders from the state led by Senator John Joko, came to consult with the APC leaders. Members of the delegations were perfecting plans to ditch the PDP for APC. Oyegun promised to assist them in defecting to ruling party. Meanwhile, the former governor if the State, Timipre Sylva who accompanied the PDP members denied having ambition for the governorship seat. When asked whether he will contest the coming governorship election, he said: “I don’t know yet, that’s the honest answer, I don’t know yet. My role is to make sure APC wins the governorship in Bayelsa, that’s my role. The APC is going to win, that we are very sure about.